The Bett Show in London is an Educational Technology Exhibition held every year for four days. Companies that supply hardware, software and other educational technology related material to schools showcase their products. Additionally there are young EdTech startup companies also exhibiting there. 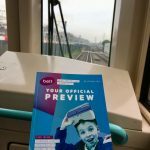 This blog post covers a short review of my visit there this year. Tutoring is a lonely profession and online tutoring is a niche within the tutoring profession itself. It is hard to judge the scale of the impact of technology on education when working alone. I have often felt like a lone voice of online tutoring and technology in tutoring in general. There are barely even a handful of tutors I know who tutor 100% online (though those who tutor a mix of online and in person are a lot larger in number). Over the years I have gone to great efforts to organise tutor meetups, find Facebook online communities and more recently attend the excellent maths conferences and CPD by the La Salle Education Network. The missing piece though has been something online tutoring/teaching related. I am a tech geek at heart and my tutoring is based completely around technology. Technology has revolutionised the effectiveness, impact and business of tutoring for me. As such I am really passionate about it and need inspiration on that angle. So it was incredible to visit Bett Show and be wowed by a giant hall of all things EdTech. 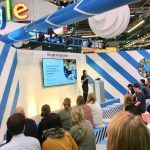 The world’s largest education technology show, 4 days, over 300 stands, many inspiring lectures, big names like Google, Microsoft, Apple putting in their weight behind EdTech products and lots of smaller EdTech companies. Seeing the technology in action there in such a vast arena was like a dream for me. From Microsoft’s Minecraft games to Google’s lecture hall and classroom there were many toys to play with and see all sorts of great things. Most of the displays and products were angled at classroom teaching, though with some creativity I am sure I can adapt them to online tutoring. Virtual Reality in teaching is much further along than I thought it was. I wore a headset and got to be in a world war 1 scene in the trenches. Thanks to some augmented reality I could see little dinosaurs on tables. Some of the smartboards out there are truly incredible, images, video, colourful drawing all on one large creative canvas. I had no idea that this was even possible. I am hoping that this type of technology can be implemented in the type of virtual whiteboards I use for my day to day tutoring. I also saw lots of other stands, including one about Dyscalculia intervention teaching via a website. It looks pretty impressive as the exercises were well designed. The one stand I had booked an appointment for was the HUE HD document camera team. When I started tweeting about their camera last year and tagging them, their social media representative was very impressed with how I use the camera in my tutoring. That camera is a classroom visualiser and they sell to schools, so online tutoring was very out of the box for them. I got invited to write a blog post on their teachers for teachers blog. And finally I got to meet the person I had been emailing all these months in person! On behalf of the Ultimate Support Group for Online Tutors Facebook group manager Joanne Kaminski, I awarded the HUE team with the tech resource of the month award. 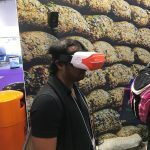 Virtual Reality headset – World War 1 simulation. I was there for a whole afternoon for about 4 hours. This is nowhere enough time to really go into the show in depth and only gives a taste of it all. I would like to plan a longer visit next year and see more of the lectures. I leave the show really inspired, energised and with so much more confidence knowing that I am not one of a few lone EdTech educators, I am in company of a whole educational technology revolution. 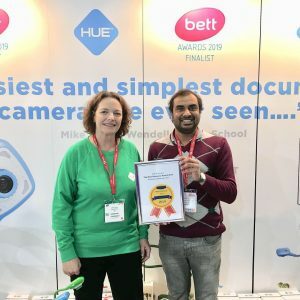 This entry was posted in Uncategorized and tagged bett show london, document camera, driverless train, edtech, education technology, education virtual reality, hue hd animation, online tutoring on February 3, 2019 by Atul Rana.